Gone are the days of the traditional mobile home, a shoebox towed around on its own chassis. These days, the houses are set on a foundation, where they usually stay put. Some have a spiffier, more suburban appearance as well. Half the houses being sold are multi-section. When Fortune magazine reported sales of manufactured homes as “sizzling,” this was the explanation: sales of manufactured homes increased one year at a rate twice the overall rate of new single-family homes. In 1956, you may have seen the original manufactured home roll down the highway. It was truly a mobile home. At 50-feet long and just 10-feet wide, little did the ancestor know that just 13 years later the width would stretch to 12-feet, and to 14-feet by 1969. By the mid-1970s that, too, seemed too narrow, and the multi-section home was introduced. Homes were built to two 14-feet wide sections and joined together at the home site. The result was a home nearing the dimensions of the traditional suburban ranch. The multi-section, with plenty of space at a bargain price, caught on quickly. By 1985, multi-section homes accounted for one-third of manufactured home sales, a share that grew to 47 percent in 1989. By 2000, almost 60 percent of the manufactured homes sold nationwide were multi-section homes. One big lure is floor space. Many modern multi-section manufactured homes offer more square footage than conventional homes built during the housing boom immediately following World War II. Today’s multi-section homes have about 70 percent of the living space of the average conventional site-built home. 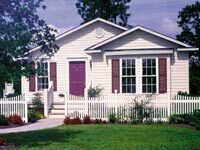 Manufactured homes can still be purchased as simple, single-section units, perhaps the ultimate in basic, affordable, comfortable living. Today, double and even triple section homes are becoming more popular. Single units can be equipped with expanding sections for more space, but it’s in doubles and triples that a truly huge array of plans are available. The prospective owner should study floor plans and inspect several homes to determine which best fits his or her lifestyle. Manufactured housing has come a long way since the “trailer” days—over 19 million people across the country have already discovered the quality and convenience a manufactured home has to offer. Hopefully you will make the decision to join them, and see for yourself how comfortable living is truly made.